Pastille Crumb Co. is a one year-old, home-run bakery that makes artisanal chocolates, muffins, tea cakes, miniature (thumb-sized) cookies and five types of homemade granola. Everything is made with very little sugar and fresh ingredients, some of which are sourced internationally as well. Preservative-free, low-sugar cakes, cookies, granola, gluten-free options. Sana, the chief baker at Pastille Crumb Co. ensures that none of her desserts and granola are ones that come with an unhealthy year-long shelf life, or are loaded with white sugar. She steers clear of fondant and chooses to dress her tea cakes in fresh flowers and cream instead. 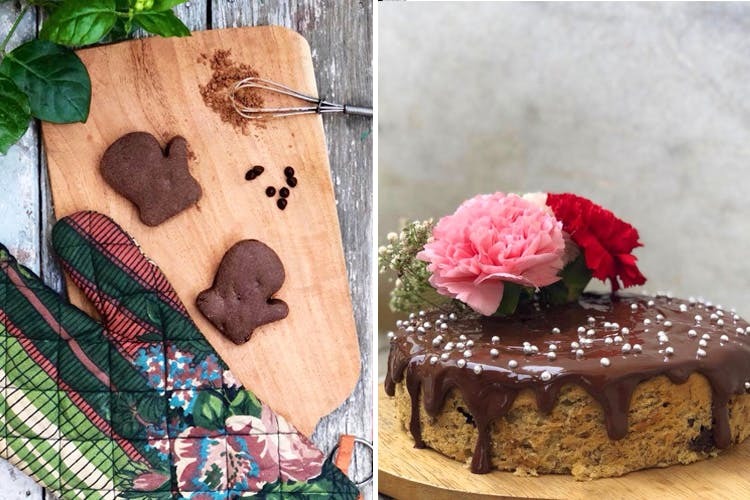 Similarly, the granola (it comes in chocolate and walnut, cranberry, tropical and white chocolate and coffee) is full of nutritional goodness from oats and superseeds and carries no artificial flavour.Our favourites from Sana’s oven: Their shortbread hearts, mitten-shaped cookies and these ganache cakes. The delivery system is far from smooth. They have two pick-up points (one in Hauz Khas Village and Jawhar Nagar in North Delhi) so if you pre-order your sweet goodies a day in advance, you can land up and get them from these locations.If you want your granola or cookies home delivered, the minimum order has to be above INR 1,500. Noida and Gurgaon folks, you might have to play an extra INR 100 as delivery charges with orders. With all this said, you’ll have to coordinate with Sana for orders to see what delivery process works mutually. This, of course, is the only downside, as we see it. Sana’s open to experimenting and customising for diabetic parents, gym nuts and healthy eaters alike. Ask her to substitute sugar for jaggery (or organic honey) or demand a specific shape (dinosaur-shaped cookies for kiddos?) or ask her to improvise on packaging (flowers with the cookie jar? Or a sweet message? )… She’s happy to oblige.